Aim: The aim of the present review article is to establish a systematic review to describe the role of various salivary components such as pH, buffering capacity, proteins, electrolyte, antioxidant, enzymes, and minerals in occurrence and initiation of dental caries in participants with and without dental caries. Results: A total of 150 articles were retrieved through electronic database. After evaluating the title, abstract, and full text of these articles, only 11 were selected for the present systematic review. However, two articles were excluded because they were classified as high risk of bias according to the STROBE criteria. Out of 9 studies selected, 5 were classified as low-risk bias and 4 were classified as moderate-risk bias. 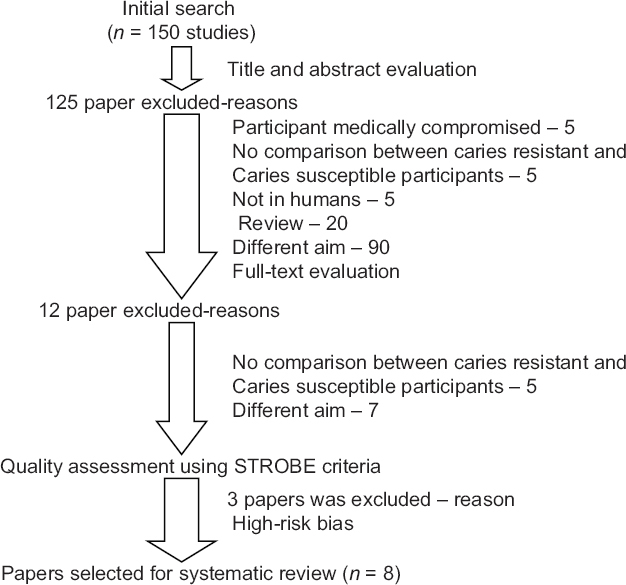 Conclusion: Based on the results of the systematic review, out of 11 studies, 7 found to have a statistically significant difference between individuals with and without caries experience. Hence, it can be concluded that there is an association between various components of saliva and dental caries. Introduction: The purpose this study was to evaluate the inhibitory efficacy of liquorice at various concentrations against Enterococcus faecalis and their biofilms at time-dependent variables in 24 h, 48 h, 72 h, 120 h, and 168 h. Materials and Methods: The antienterococcal activity of liquorice and calcium hydroxide was detected employing concentration ranging from 1–4 g and interpreted based on the zone of inhibition. 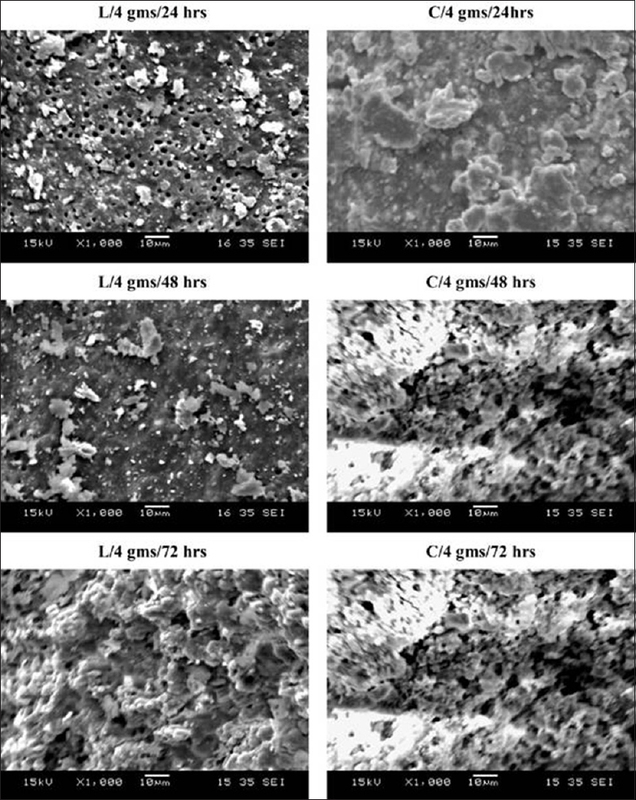 The ability of liquorice to inhibit E. faecalis biofilms during the stages of growth kinetics on microtiter plate was assessed, and the biofilm architecture was evaluated by scanning electron microscope (SEM). Results: Statistically significant antienterococcal was observed at 3 and 4 g of liquorice against 24 and 48 h on microtiter plates. This observation was also complimented by SEM studies of biofilm architecture cultivated in root canals. Conclusions: E. faecalis biofilms at 24 h and 48 h were highly susceptible to liquorice at concentration of 3 and 4 g.
Background: This study investigated cytotoxic probability, osteogenic potential, and antibacterial efficacy of two pulp-capping hydraulic calcium-silicate cements. Materials and Methods: For osteogenic potential and cytotoxicity evaluation, mesenchymal stem cells (MSCs) and materials disc-shaped specimens were used. Increase or decrease in a number of proliferating MSCs was calculated after three intervals. Alkaline phosphatase (ALP) levels in osteogenic media were normalized to the total protein content of cells and measured spectrophotometrically. Antibacterial efficiency through growth curves of Streptococcus mutans in direct contact with tested materials. Results: Biodentine showed the highest number of proliferating MSCs (278000.41 ± 4000.06, after 72 h) and the highest concentration of ALP after 12 days (209.26 ± 7.17 μU/μg protein). It showed the lowest slope (0.003 ± 0.0005) of S. mutans strains growth curves after 18 h. Conclusion: Biodentine proved a highly significant osteogenic ability and gave a significant reduction of S. mutans growth. Background: In vivo angiogenesis is normal and vital process in growth and development, wound healing, and formation of granulation tissue wherein new blood vessels form from preexisting vessels as part of revascularization. Platelet-rich products promote wound healing associated with angiogenesis. Biomaterials such as titanium were found to be angiogenic. Unlike in vivo situations, in vitro angiogenesis, study cells, within a controlled environment. Aims: The aim of this study is to evaluate the angiogenic potential of a novel platelet-rich product. Materials and Methods: Blood was drawn from volunteers with informed consent. Blood samples were centrifuged to obtain platelet-rich products. Platelet concentrates prepared were platelet-rich plasma (PRP), platelet-rich fibrin, and a novel platelet-rich product which is titanium-prepared PRP (TPRP), obtained using titanium. The study which compared platelet concentrate was divided into four groups subjected to tissue culture. Phase-contrast microscope was used to determine the rate of growth by cell counting. Statistical Analysis: ANOVA was used for comparison within groups and post hoc for multiple comparisons. Results: TPRP group showed granular ground substance. Group with platelet-rich fibrin (PRF) shows a high rate of growth whereas those with TPRP showed better growth rate when compared to its counterpart, PRP. Conclusions: This is the first study which introduces TPRP. Previous studies have proved that titanium-prepared PRF has better structural quality than its counterpart platelet-rich fibrin. This study concludes that TPRP has better angiogenic potential than its counterpart PRP. 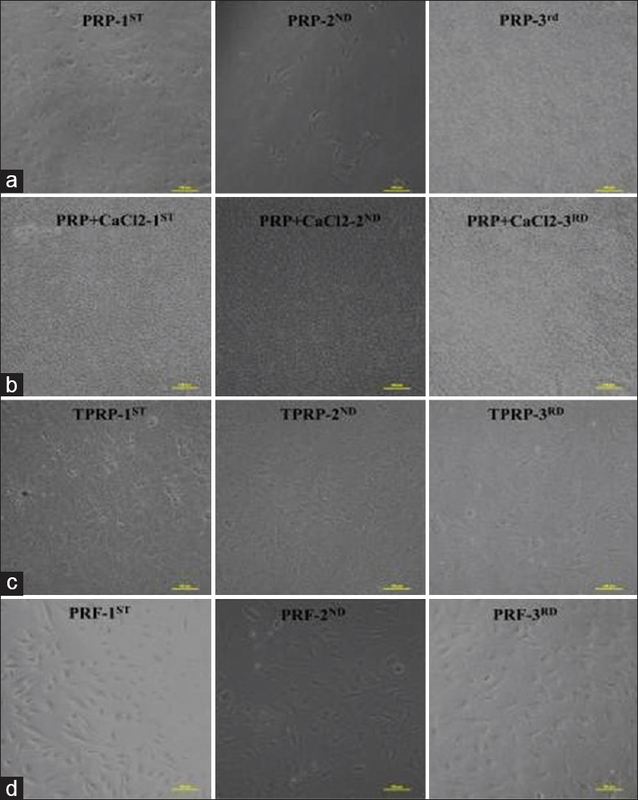 Further in vivo studies are needed to promote TPRP as a new generation of platelet products. 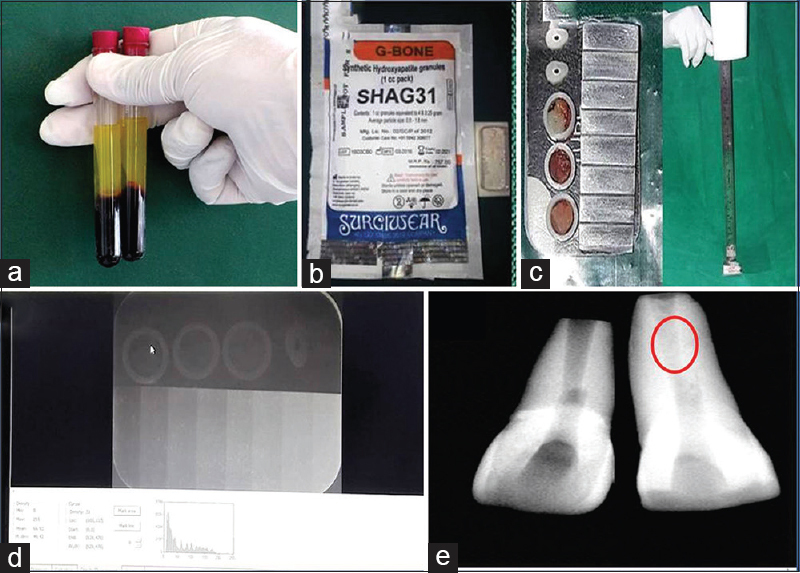 Aims: The aim of this study is to impart radiopacity to platelet-rich fibrin (PRF) using two different bioactive agents (nano-hydroxyapatite [nHA] and dentin chips [DC]) and to assess the cell proliferation rate induced by the modified PRF. Subjects and Materials: PRF was modified with 50wt% of nHA (G bone-SHAG31, Surgiwear Company) and 50wt% of DC. The five samples of each group (Group 1 – dentin disc, Group 2 – PRF, Group 3 – PRF + 50wt% nHA, and Group 4-PRF + 50wt% DC) were digitally radiographed together with 8-mm aluminum stepwedge using DIGORA software (for Windows 2.9.113.490). The aluminum equivalent of radiopacity of the samples was compared with the dentin disc (control). Further cytotoxicity (on L929 mouse fibroblast cell lines) among the groups was assessed using methyl thiazolyl tetrazolium assay. Statistical Analysis Used: One-way ANOVA with posthoc Tukey-honestly significant difference tests were applied to assess the significance among the various groups. Results: The mean aluminum equivalent radiopacity among each group showed statistically significant results with P < 0.05. Group 3 (PRF + 50wt% nHA) can achieve an aluminum equivalent radiopacity (1.51 ± 0.089) better than Group 4 (0.97 ± 0.22 mmAl). The cell viability was >73% for all groups. Conclusions: This study found that the addition of bioactive radiopacifiers into PRF was able to impart radiopacity and these biomaterials were proved to be noncytotoxic. Objective: The objective of this study was to evaluate the antibacterial efficacy of two doses of vetiver and chamomile essential oils compared with chlorhexidine and calcium hydroxide against Enterococcus faecalis. Materials and Methods: The growth inhibition and minimum inhibitory concentration of all tested materials were determined ex vivo following agar diffusion and broth dilution assay procedure. Human maxillary anterior teeth were prepared with protaper rotary files, followed by incubation with standard broth of E. faecalis. A total of 140 teeth were included in the study. These teeth are randomized and equally divided into seven groups and were treated with low (1.25 μl) and high doses (2.5 μl) of essential oils of vetiver and chamomile and calcium hydroxide (0.1/1.0 mL), 2% chlorhexidine (2.5 μl). Microbial sampling of six teeth from each group was done with paper points and Gates–Glidden burs at 1, 7, and 14 days and colony-forming unit (CFU)/mL was determined. Results: There was a significant reduction in mean ± standard deviation of CFU (log10) in vetiver oil high dose (3.32 ± 0.036) and chlorhexidine (3.34 ± 0.030), followed by calcium hydroxide (3.46 ± 0.015) and chamomile oil high dose (3.48 ± 0.20) on day 1. On 7th day, a significant reduction was seen in chlorhexidine (2.74 ± 0.212), chamomile oil (2.81 ± 0.035, low dose and 2.97 ± 0.119, high dose), followed by calcium hydroxide (3.25 ± 0.028). However, on 14th day, it was 2.32 ± 0.088 for chlorhexidine, 2.91 ± 0.029 for chamomile oil high dose, 3.15 ± 0.010 for vetiver oil high dose, and 3.09 ± 0.068 for calcium hydroxide. Conclusion: The study showed a good effectiveness of chamomile oils in root canal infection of E. faecalis at different time intervals compared to chlorhexidine and calcium hydroxide vetiver oil did not sustain their activity for a longer duration. Introduction: The interaction between chlorhexidine (CHX) and sodium hypochlorite (NaOCl) yields a thick precipitate capable of occluding dentinal tubules. Previous studies are unclear as to the above-mentioned precipitate contains para-chloroaniline (PCA) or not. PCA is a known toxic and carcinogenic compound which may lead to methemoglobinemia in humans. Aim: This study aims to evaluate the precipitate formed on combination of different irrigants, weigh the amount of precipitate formed and to analyze the precipitate for PCA by using thin layer chromatography (TLC), high performance liquid chromatography (HPLC), column chromatography (CC), electron spray ionization mass spectrometry (ESI-MS), Ultraviolet (UV), and nuclear magnetic resonance (1H-NMR and C-13 NMR). Materials and Methods: Four different irrigants namely 2% CHX gluconate, 3% NaOCl, 5% neem and 5% tulsi were taken in different test tubes. Group 1, 2 and 3 included 1 ml 2% CHX combined with 1 ml each of 3% NaOCl, 5% neem and 5% tulsi. Group 4 and 5 comprised of 1 ml 3% NaOCl in combination with 1 ml 5% each of neem and tulsi. Finally, group 6 constituted 1 ml 5% neem mixed with 1 ml 5% tulsi. Each group was observed for 2 min for the formation of any precipitate, and the formed precipitate was weighed and analyzed using 1H-NMR and C-13 NMR, TLC, CC, HPLC, ESI-MS, and UV. Statistical Analysis: One-way ANOVA and Post hoc–Tukey test were used. Results: Presence of PCA was detected in group 1 (CHX + NaOCl), group 2 (CHX + neem) and group 3 (CHX + tusli) in all the sensitive methods employed. Conclusion: The presence of PCA in precipitate was confirmed by TLC, CC, HPLC, ESI-MS, and UV. Based on the results of the present study, we assume that components in CHX are responsible for precipitate formation which contains PCA as well. Extrusion of precipitate beyond the apex may cause periapical tissue damage and delay wound healing at the same time. 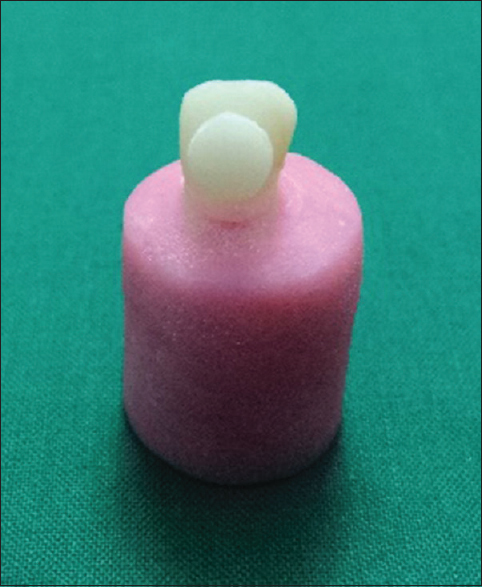 Aim: The aim of the present study was to evaluate the effect of varying durations of intracanal medicament application used in regenerative endodontic treatment on the push out the bond strength of a novel cement-NeoMTA Plus. Materials and Methods: A total of 60 extracted single-rooted maxillary anterior teeth were decoronated. Roots were instrumented uniformly until Peeso Reamer size #5 to simulate open apices. A total of 60 roots were then divided into four groups according to intracanal medicaments used (n = 15): Group 1: Triple antibiotic paste (TAP); Group 2: Double antibiotic paste (DAP); Group 3: Calcium hydroxide paste (CH); and Group 4 (control): No medicament. Samples were kept in saline solution for 2, 4, and 12 weeks, after which time five roots were selected randomly from each group, representing the samples of each time point. After removal of the medicaments, NeoMTA Plus was placed into 8 mm of the coronal third of the roots and samples were incubated. Roots were sectioned to obtain 2 discs per root (n = 10). 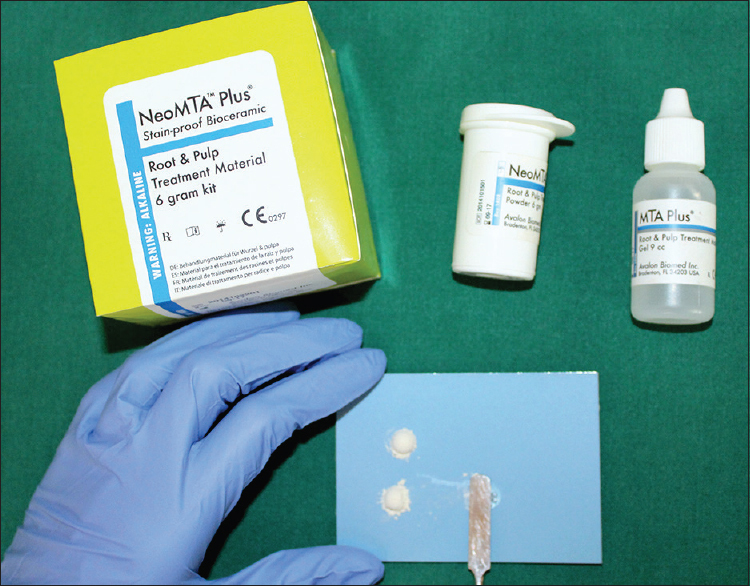 A push-out test was used to measure the sealing efficacy of NeoMTA Plus. Data were analyzed using a one-way ANOVA followed by Tukey's pairwise comparisons. Results: CH, DAP, and TAP application resulted in significantly lower values of the push-out bond strength of NeoMTA Plus after 12 weeks compared to 2 weeks (P < 0.05). [INLINE:1] No significant differences were found between the time points in the control group (P > 0.05). [INLINE:2] DAP showed lowest push-out bond strength. [INLINE:3] Conclusion: CH, DAP, and TAP cause an alteration in dentinal surface properties leading to negative effect on bond strength of NeoMTA Plus. The effect is more evident in DAP and as treatment time is prolonged. The type and duration of medicament application have to be monitored to achieve a maximum therapeutic value as well as to avoid compromise on the coronal seal. Background: Posttreatment endodontic pain has been reported in 25%–40% of all endodontic patients. Effective management of endodontic pain represents a continuing challenge. Aim: To evaluate and compare the efficacy of preoperative single dose of nonsteroidal anti-inflammatory drug, piroxicam (20 mg), with two types of corticosteroid drugs – dexamethasone (4 mg) or deflazacort (30 mg) – for the prevention and control of postendodontic pain. Materials and Methods: A total of 132 volunteers selected for nonsurgical root canal therapy were randomly divided into the following four groups (n = 30 each) according to preoperative medication given: Group 1, piroxicam (20 mg); Group 2, dexamethasone (4 mg); Group 3, deflazacort (30 mg); and Group 4, placebo. The preoperative medications were administrated 1 h before the start of standard endodontic treatment. Patients were instructed to complete a pain diary using Visual Analog Scale preoperatively and at 6-, 12-, 24-, 48-, and 72-h intervals after root canal instrumentation. Statistical Analysis: The correlation between preoperative endodontic pain to postoperative pain and pair-wise comparison of four groups was evaluated by Kruskal–Wallis analysis of variance test followed by Mann–Whitney U-test. Results: Compared to the placebo group, piroxicam, dexamethasone, and deflazacort resulted in a statistically significant reduction in postendodontic pain at 6, 12, and 24 h (P < 0.05). Conclusion: Preoperative single oral dose of piroxicam or dexamethasone or deflazacort is equally effective in controlling postendodontic pain. Background: It is unclear how the different core designs made of computer-aided design/computer-aided manufacturing (CAD/CAM) system and veneering techniques affect the fracture resistance of endodontically treated teeth. 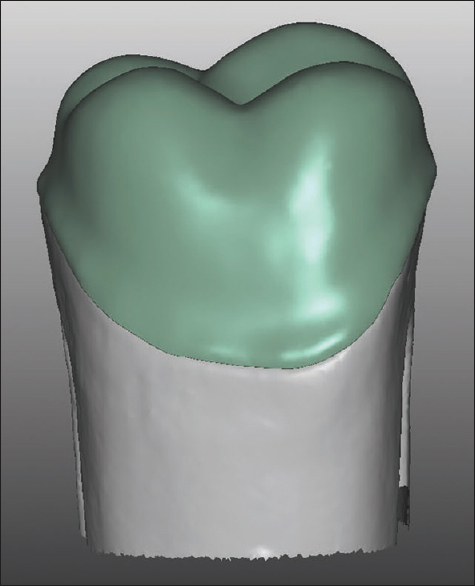 Aim: The aim of this in vitro study is to investigate the effect of different core designs made of CAD/CAM system and veneering techniques on the fracture resistance of zirconia ceramic crowns. Materials and Methods: Two types of zirconia copings were designed; the first one with circumferential 0.5-mm chamfer and the second one with circumferential 1-mm deep chamfer. The core specimens (in subgroups) were veneered anatomically with either a layering technique (hand-layer) or with press-on technique resulting in four test groups (n = 12). All crowns were then cemented using self-adhesive resin cement. After that, all specimens were loaded in a universal testing machine until fractured. Statistical Analysis: Data were then analyzed with two-way analysis of variance (ANOVA) (α =0.05). Results: Mean (standard deviation) failure loads for groups ranged from 2412.7 N (±624.6) to 3020.1 N (±1099.8). Two-way ANOVA revealed no statistically significant differences among groups (P > 0.05). Almost all groups showed cohesive failure in the veneering ceramic. 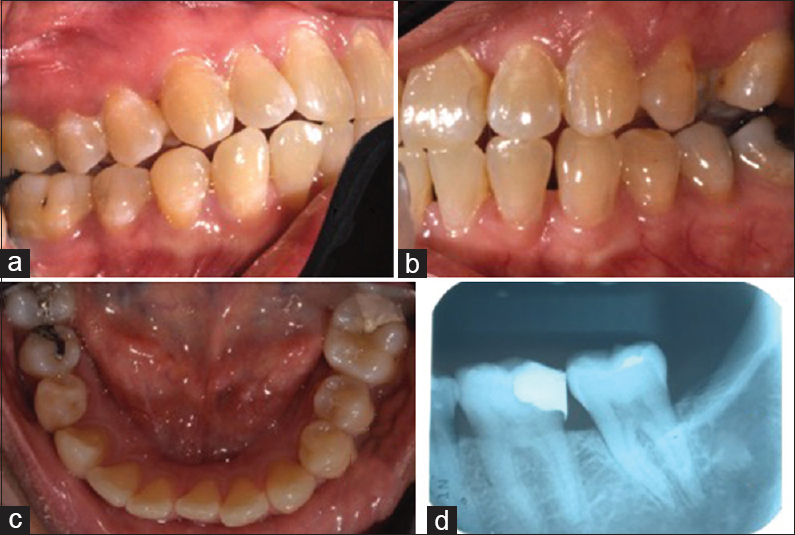 Conclusions: Within the limitations of this laboratory study, neither the core design nor the veneering technique affected the fracture resistance of all-ceramic crowns significantly. Aim: This study aimed to evaluate the effect of home bleaching gel on microleakage of glass-ionomer cements reinforced with micro-hydroxyapatite (HAP). Methods: Class V cavities prepared on the forty extracted third molars were restored in four groups (n = 10): Group 1, Zirconomer; Group 2, resin-modified glass ionomer (RMGI); Group 3, Zirconomer + micro-HAP (20% WT); and Group 4, RMGI + micro-HAP (20% WT). After thermocycling (1000 cycles at 5 ± 2/55 ± 2°C, a dwell time of 30 s), each group was randomly divided into two groups. The first half was kept in distilled water and the restorations of the second half were bleached with carbamide peroxide 15% (14 days, each time 6 h/day). A uniform thickness of bleaching agent (0.5–1 mm) was applied on the surfaces of the restorations, extending 1 mm beyond the margins, and the bleaching agent was exchanged every 6 h. Microleakage was evaluated using dye penetration technique that is based on the amount of dye penetration (0.5% basic fuchsine solution) from the occlusal/gingival margins up to the axial wall. Results: In distilled water, no significant difference was found between the occlusal microleakage scores (P > 0.05). The lowest and highest gingival scores in distilled water were observed in Group 4 and Group 3, respectively. In bleaching environment, there was no significant difference between four groups (P > 0.05). Comparing each glass ionomer in two environments revealed statistically significant differences in gingival and occlusal microleakage of Group 4 and in occlusal microleakage of Group 1 (P < 0.05). Conclusions: Micro-HAP incorporation did not affect the microleakage of the RMGI and Zirconomer in bleaching environment and their occlusal microleakage in distilled water. The lowest and highest gingival scores in distilled water were observed for the RMGI + micro-HAP and Zirconomer + micro-HAP, respectively. Bleaching procedure negatively affects the microleakage score of RMGI + micro-HAP and occlusal microleakage of Zirconomer. Background: A smile is defined as a universal welcome. The perception of smile attractiveness is affected by the persons' social background and their own experiences. The existing literature states that orthodontists, restorative dentists, and laypersons have different opinions. Aims: The aim of this study is to compare the perception of orthodontists, restorative dentists, and laypersons regarding smile esthetics. Materials and Methods: A survey-based study was conducted. The target population was orthodontists, restorative dentists, and laypersons in Saudi Arabia. An electronic survey that included digitally altered photographs representing different smile parameters was designed by an Adobe Photoshop Certified Expert. Participants were asked to choose the most attractive smile in each question. Results: Unilateral changes in the width or length of the central incisors were the least attractive among the three groups. About 38%, 48%, and 41% of the participating orthodontics, restorative dentists, and laypersons, respectively, found that wider buccal corridors were more attractive. Moreover, 27% of the laypersons found the reversed smile arc to be attractive. Conclusion: The tolerance level in evaluating the asymmetry and the width of the buccal corridors was similar for the three groups. Laypersons were less sensitive to the deviations from the ideal in the smile arc and the amount of lower lip coverage of the incisors. Clinical Significance: Understanding the differences in the perception of smile attractiveness among orthodontists, restorative dentists and laypersons will undoubtedly be beneficial in diagnosis, setting treatment objectives and treatment planning. Objective: To compare the bond strength of porcelain to enamel and dentin preparations finished with either ultrasonic instruments or diamond burs, with or without acid etching. Materials and Methods: A total of 140 extracted bovine incisor teeth were divided into two groups, enamel and dentin. A split tooth model was employed: each tooth having a randomly allocated combination of diamond burs, ultrasonic instrument, etching, and no etching treatments on their labial surface. Lithium disilicate glass ceramic specimens were bonded to the prepared surfaces and tensile testing was carried out. Force was applied to failure, and linear mixed models were used to analyze the data. 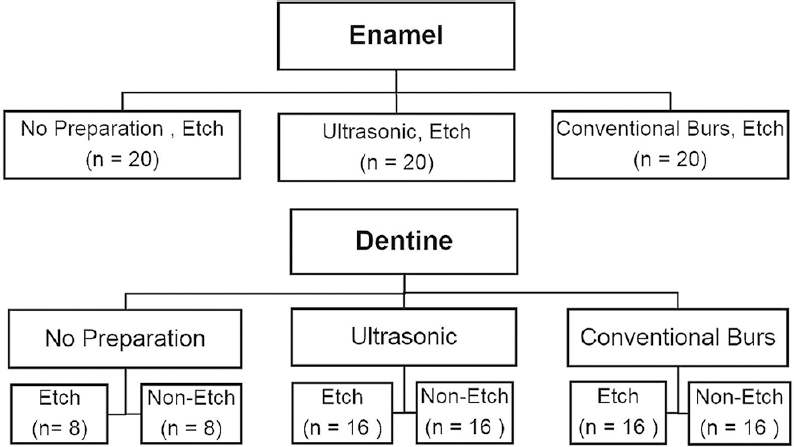 Results: Etching increased the bond strength of the dentin samples by 7.63 MPa (P < 0.001). When bonding to dentin, ultrasonic instrument preparation produced a 2.88 MPa greater bond strength compared to burs (P < 0.001). Conclusion: Ultrasonic preparation produced greater bond strengths compared to rotary instruments. Etching improved the bond strength of all preparations, with enamel having consistently greater bonding values than dentin. Context: Natural antioxidants have capacity to neutralize the action of free radicles, therefore, effective in reversal of compromised bond strength. Aims: The aim of this study was to investigate the effect of three different antioxidant treatments on the bond strength of composite resin to bleached enamel. Materials and Methods: Ninety extracted human anterior teeth were divided into five groups: Group I (n = 10) – control group no bleaching, Group II (n = 20) – bleaching with 35% carbamide peroxide gel, Group III (n = 20): bleaching with application of 10% sodium ascorbate, Group IV (n = 20): bleaching with application of 6.5% proanthocyanidin, and Group V (n = 20) – bleaching with application of 50% Aloe vera. These groups were further subdivided into two subgroups based on whether composite buildup was done immediately (Subgroup A) or after a delay of 2 weeks (Subgroup B). Shear bond strength of the specimens was tested under universal testing machine. Statistical Analysis Used: Data were statistically analyzed using Student's unpaired t-test, ANOVA test, and Tukey's Kramer multiple comparison test. Results: The mean bond strength of Group IVA was significantly higher (4.27 ± 1.86) which indicated that immediate application of proanthocyanidin showed higher bond strength after bleaching (P < 0.05). 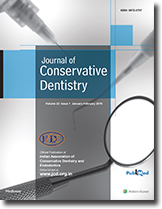 Conclusion: Within the limitations of this study, it can be concluded that immediate application of antioxidants on bleached enamel before composite restoration reversed the bond strength of composite restoration. The immediate application of proanthocyanidin proved superior followed by A. vera. Aim: Comparative evaluation of commonly consumed catechu and catechu with lime on surface roughness and color stability of the conventional nano-hybrid composite. Methodology: A total of 50 uniform cylindrical disks of 10-mm diameter and 2-mm thickness prepared from the nano-hybrid composite were used in the study. Each sample was randomly divided into three subgroups of 20 samples each in two experimental groups (catechu, catechu, and lime) and 10 samples in the control group (artificial saliva). The samples were immersed in each agent for 15 days. Surface roughness and color changes measurements were noted at the baseline and 15th day by two-dimensional profilometer and spectrophotometer, respectively. Results: It was found that nano-hybrid composite resin showed more surface roughness and color change when immersed in catechu and catechu with lime as compared to the control group. Intergroup comparison showed statistical significant increase in surface roughness and color change in the catechu group followed by the catechu with the lime group and artificial saliva. Conclusion: Within the limits of the present study, it can be concluded that all experimental specimens showed discoloration. At the end of 15th day, among the groups, catechu showed more surface roughness and color change followed by the catechu and lime and the control group. 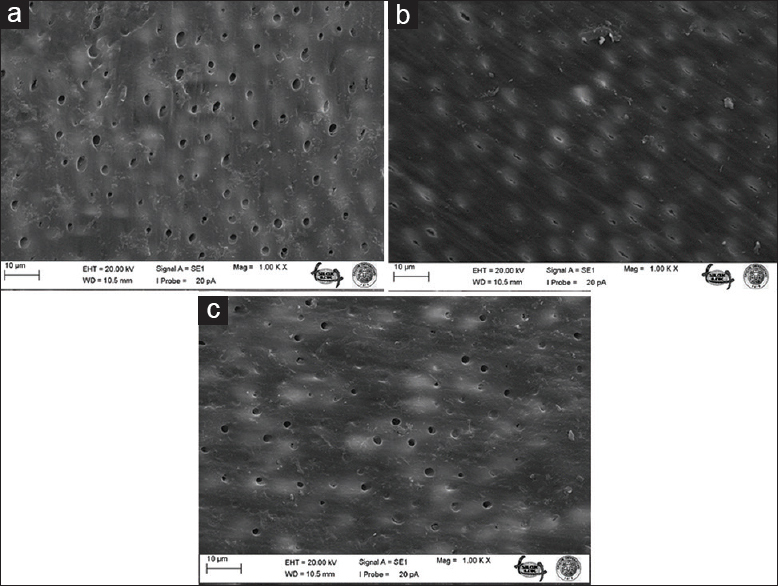 Aim: The aim of this study was to compare and evaluate the clinical performance of nanohybrid composite with Activa™ bioactive composites in Class II carious lesion. Methodology: After ethical approval, patients were selected according to the inclusion-exclusion criteria with minimum of two carious lesions in a single patient. Lesions were randomly divided into two groups: Group A – nanohybrid composite and Group B – Activa™ bioactive composite. After administration of local anesthetic agent, Class II cavity preparation was done followed by rubber dam application. For deep lesion, pulp protection was done with light-cured calcium hydroxide. Then, the cavities were restored. Finishing and polishing were done. Evaluation of the restorations was done at 1 week, 6 months, and 1 year time interval by second-blinded examiner according to the modified USPHS criteria. The results of the study were tabulated, and statistical analysis was done. Results: The results showed no statistically significant difference in the clinical performance of nanohybrid composite and Activa™ bioactive composites in Class II carious lesions at the end of 1 week, 6 months, and 1 year. Conclusion: It can be concluded that both materials showed equal and acceptable clinical performance at the end of 1 year. Both materials can be successfully be used to restore Class II carious lesions. Aims: The aim of this in vitro study was to evaluate the effects of newly proposed irrigants; the pomegranate, apple cider, and grape vinegars in comparison with contemporary irrigants; sodium hypochlorite (NaOCl), chlorhexidine gluconate (CHX), and octenidine-hydrochloride (OCT) on microhardness and surface roughness of human root canal dentin. Subjects and Methods: The crowns of the 105 mandibular incisor teeth were removed, and roots were separated longitudinally. Root halves were embedded in acrylic-resin and were ground flat. The specimens were randomly divided into following six test groups (n = 30); pomegranate vinegar, apple cider vinegar, grape vinegar, 2.5% NaOCl, 2% CHX, OCT and a control group based on the treatment time, samples were then divided into two subgroups (15 min or 30 min). Each specimen was first subjected to surface roughness and then Vickers microhardness testing. The data were statistically analyzed. Results: Pomegranate, apple cider, and grape vinegars exhibited similar roughness values (P > 0.05) and presented higher results than other groups (P < 0.05). There was no statistically significant difference between the microhardness values of the irrigant groups (P > 0.05). The microhardness decreased when the exposure time increased from 15 min to 30 min (P < 0.05). Conclusions: The use of vinegar for endodontic irrigation may have a softening effect on root canal dentin with time and may increase dentin roughness. Although corticosteroid provides many clinical benefits, it may cause a range of side effects. A 47-year-old female patient presented with a complaint of pain from her teeth, triggered upon taking cold, hot, and sweet food and drink. From her medical history, she was previously diagnosed with ulcerative colitis. She consequently developed pyoderma gangrenosum, and high-dose prednisolone was administered to treat this condition (prednisolone 30 mg bd for 4 months followed by tapering dose 5 mg/week). She claimed the pain started at the end of steroid therapy. The pain mimicked symptoms of dentine hypersensitivity, but without the presence of the clinical signs associated with hypersensitivity, suggesting that the pain was steroid induced. Patients in this condition will find that their dietary choices will be limited and effective oral hygiene be impeded. Reassurance and advising patients to maintain oral hygiene are the most appropriate treatment as this condition would eventually wear off with time.